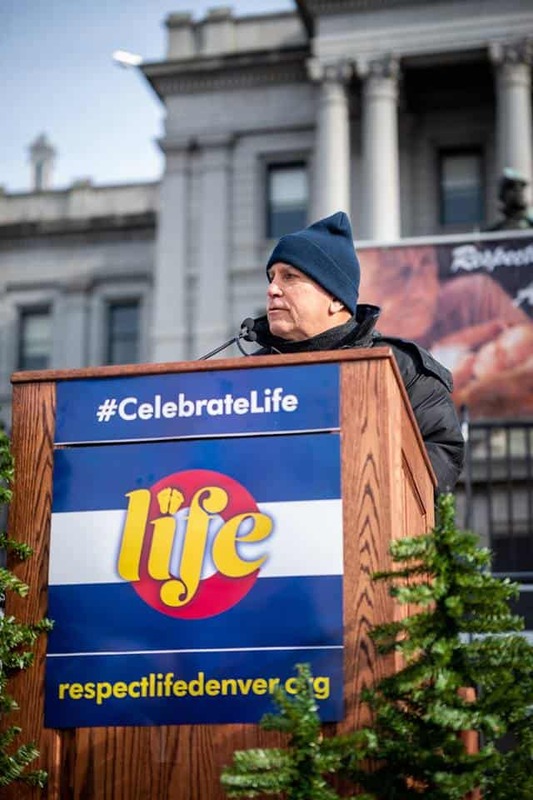 Editor’s Note: The following remarks were delivered by Archbishop Aquila on the West Steps of the Colorado State Capitol building on Jan. 12, 2019 for the Celebrate Life March. Remarks are as prepared not necessarily as delivered. Have you ever compared the difference between a candle in the daylight and at night? They both give off the same amount of light, but the absence of light at night time makes the candle appear so much brighter. When it comes to the support of our surrounding culture for life at every stage and respect for the dignity with which God has imbued every person, the light is fading. But it is precisely in this dimly lit place that the light of the truth and our testimony to it with our lives will shine more clearly and brightly. Jesus tells us, as he told the disciples – “You are the light of the world. A city set on a mountain cannot be hidden” (Mt. 5:14-16). We see this even in our landscape. When we look up at the foothills from the city or we are looking down from the mountains, our cities and their lights stand out. As people who strive to protect life at every stage, we are called to be like this city on a mountain, to be the light of the world in these times God has willed for us to live in. There are many areas in which the light of the truth is being suffocated. In this past midterm election, some of those lawmakers who were in support of the Church’s teaching in these key areas failed to win their seats, which makes our task of remaining vigilant and engaged all the more important. However, there are still politicians in the new legislature that believe as we do, and others who are willing to work with us on certain issues, even if we have other disagreements. We must not let these disagreements prevent us from working together when we can. During this legislative session we hope to see an effort to repeal the death penalty in Colorado—a measure that the Church has long advocated for, since our prison system can ensure these criminals pose no danger to the public once they are incarcerated. All life has dignity and worth, even the lives of those who have killed others. The state should not participate in the cycle of violence by taking life but should instead strive to protect it. In a 1957 sermon he gave on loving our enemies, Dr. Martin Luther King, Jr. illustrated this teaching of Jesus thus, “Returning hate for hate multiplies hate, adding deeper darkness to a night already devoid of stars. Darkness cannot drive out darkness; only light can do that. Hate cannot drive out hate, only love can do that” (Sermon compiled in the book Strength to Love, Chapter 5, Love Your Enemies). As I stand here in front of the Capitol, I challenge you to also be vigilant and remain engaged as the legislature considers bills that could profoundly change our state’s laws in the arena of life, as well as how our state interacts with issues of sexuality, which are always closely linked with life. On the surface it might seem like sexuality and the protection of life at all stages are not related. But sexuality is closely linked to our identity as co-creators with God; they share deep roots. The Evil One hates God, so it should be no surprise that he takes every opportunity to distort and confuse human sexuality in our society. It should not surprise us that he encourages efforts to devalue and destroy life as well. May God bless each and every one of you. May he bring you into a deeper encounter with him so that you are a light that cannot be contained.